I saw Farmageddon yesterday, the documentary by Kristin Canty. What a pleasant surprise — Ms. Canty was there and took our questions. She is one bright and reasonable human being and she had no idea what she was getting into by creating this film. Following her path and stating her beliefs are probably straining her personal life to its outer limits. What a woman, what a spine, what story! The movie poster to the left is from the Farmageddon Facebook page – I copied it here because it is so… wonderful! I am sorry I have not been able to find out who designed it. Damn, y’all, we better start paying attention. Our food choices are being legislated away from us at a frightening pace. Very educated people like biologists and food scientists choose raw milk, raw yogurt, and cheese over the grocery store stuff. Support your local farms and buy what you can from them. We need them as much as they need us. Maybe more. Make an effort to see this film. It is logical, reasonable, and fair. People get a slap on the wrist for selling street drugs. Families get raided and have their livelihoods destroyed for selling raw milk. Many children and adults with allergies and asthma recover when they switch to raw milk. Many lactose intolerant people can drink raw goat milk without side effects… if they can get it. Dairy laws are state specific. Know yours. Pastures full of dairy animals are pretty. We should have more of them. Umm…. Film Screen Audience… don’t talk to Ms. Canty about whether or not she thinks she’ll be killed. She’s under enough pressure. Take one step today to protect your choices. Read your local dairy laws. Call or write a politician. Shop at a local farm. Start asking questions, stop the complacency. Tell your friends and neighbors to engage. Apathy is a great enemy and we must keep the right to make choices about food. Oh, you should watch Farmageddon. It’s pretty cool what one Mom can do when she puts her mind to it. Wow, gret post; very eye-opening. Now I want to see the film. The poster is cool, too; I could paint that a la Bibimpressionism for you! I would LOVE to see your take on it! Lots of photos on this site – feel free to paint! It is illegal to buy raw milk in North Carolina. I have heard that you can go over the border to South Carolina and get it. With all the problems the world has this kind of regulation is such a waste! I agree, Dana! Someone in Wisconsin or N.C. could do drugs, or smoke when pregnant, but can’t share a cow with a neighbor. Hunh? Have the legislators and/or other people in favor of these stupid laws made any statements as to why they believe the laws are still necessary? Just curious (I should have gone to the movie with you). 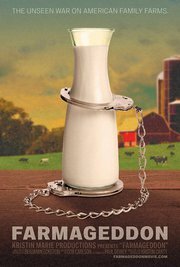 I’m a skim milk drinker myself – even 2% tastes too creamy to me – but if people want raw whole milk right out of the cow they should be able to buy (and sell) it, especially considering it is perfectly legal to basically sell poison in the form of sugary soda pop and all the other garbage on the grocery store shelves. At this time, it appears to be politics and money that keep the laws in place. About 70% of U.S. dairies (that number is from memory, so verify before repeating) have been legislated out of business in the last two decades, using state regulations, fees, taxes, and by burying them in paperwork. The big factory dairies appear to sponsor legislation either directly or indirectly. If enough small farmers are squeezed out, the big diaries get the $$ and the business is done their way, with antibiotics (drug companies have a lot to lose, too) and growth hormones, and factory farming. Large scale in a small space = big bucks and disgusting conditions for animals. Yes. I think they treat purveyors of milk and heroin in much the same fashion, though.